Helping nonfiction writers make their best work better. 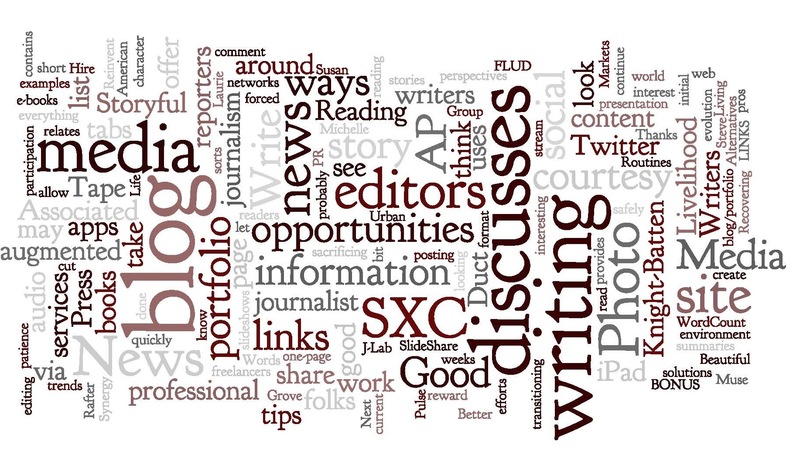 Wordle image representing Write Livelihood’s home page. Susan Johnston describes five ways that time on social media enhances her freelance writing business. You Ask, I Answer: How Do I Know if My Writing Is Any Good? Scott Rosenberg, the author of Say Everything and Dreaming in Code, writes on his Wordyard blog about his attempts to stay current on the impact of e-reading devices and e-books on the print publishing industry. Welcome Back Wordle… Plus 7 Other Free Word Cloud Generators! Michael Gorman, writing on his 21st Century Educational Technology and Learning blog, discusses the pros and cons of a number of word cloud generators. Although he’s writing for teachers, the clouds could be used in a variety of ways by writers and editors — analyzing frequency of word usage, summarizing long passages by looking at keywords, taking a fresh approach to self-promotion by generating a word cloud from one’s resume, etc. Meditations on the creative process.